With numerous Chicago locations already under their belt, fashion retailer Akira is making it's way South with the newest addition coming to Hyde Park. 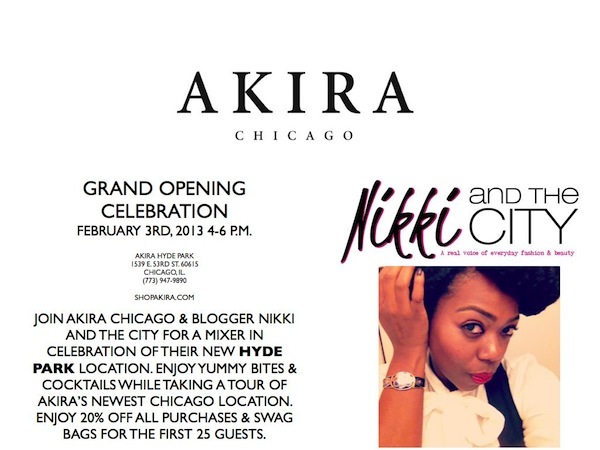 The Grand Opening will take place Sunday, 2/3 from 4-6p and be hosted by Chicago blogger Nikki and the City. The launch time is cutting it close to the Superbowl Kick off, but if you're in the area I'd suggest stopping by to get a peek at the location and snag 20% off all purchases! Can't beat that deal.